Fluidall’s Jobber Packages for Coolant are a cost-effective equipment solution, are rugged enough for redistribution and refillable customer operations. Easily reconditioned for redistribution, the Jobber packages for Coolant boast a compact package footprint of 44" x 44" with a bulk storage capacity of 180, 240 or 330 gallons of Coolant. The refillable Coolant tank is translucent to provide a visual inventory of levels inside and features an easy fill design through the angled fill port located on the top of the tank. 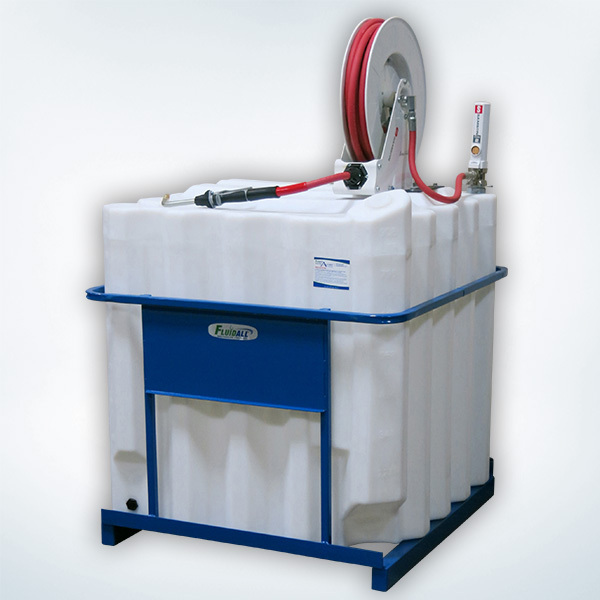 Mounted to the top of the Jobber’s Coolant storage tank is a steel plate that secures a fifty foot hose reel and the coolant pump package. The fully welded steel cage features a placard for ID labels. The steel cage is forklift ready, and wraps around the packaged equipment, allowing the coolant package to be easily set into placement at your customer’s location. 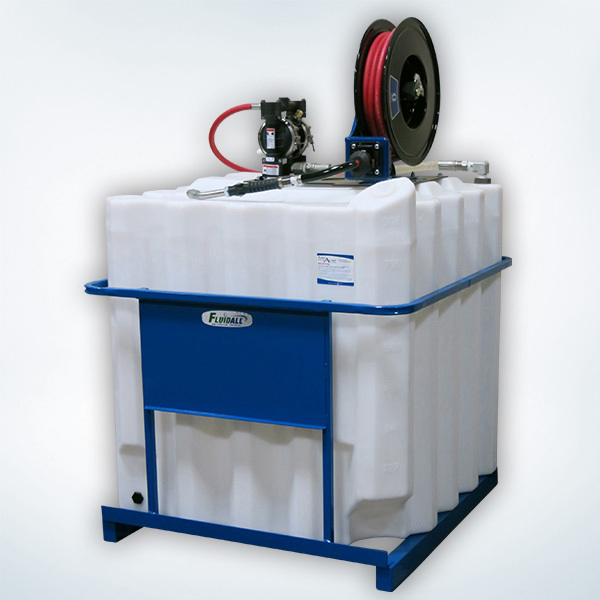 Fluidall’s Jobber Packages for Coolant, Jobber Packages for Oil and Jobber Packages for DEF arrive fully assembled. Forklift Ready Steel Cage with Placard for ID Labels, and Graco Equipment Package (Graco Husky 716 DDP Pump, Reel with 50’ Hose, Non-Metered Control Handle, Air Regulator). Delivered Fully Assembled and Ready to Fill. The Coolant Jobber Package is also available with a Steel Secondary Containment Vessel, replacing the steel cage. Please Inquire. JT180GDCP Graco Husky 716 DDP Pump 180 Gallons 44"W x 44"D 56"
JT240GDCP Graco Husky 716 DDP Pump 240 Gallons 44"W x 44"D 66"
JT330GDCP Graco Husky 716 DDP Pump 330 Gallons 44"W x 44"D 80"
Forklift Ready Steel Cage with Placard for ID Labels, and Graco Equipment Package (Samson 1:1 Pump, Reel with 50’ Hose, Non-Metered Control Handle, Air Regulator). JT180SCP Samson 1:1 Pump 180 Gallons 44"W x 44"D 56"
JT240SCP Samson 1:1 Pump 240 Gallons 44"W x 44"D 66"
JT330SCP Samson 1:1 Pump 330 Gallons 44"W x 44"D 80"